Megaburgerpizza: Move over, ramen burger. There’s a new hybrid food in town and it’s a college kid’s dream. The Megaburgerpizza is exactly what it sounds like: an enormous sandwich made up of burger patties sandwiched between two 11-inch cheese pizzas, dressed with ketchup, onions, pickles and mustard, weighing in at nearly 3 lbs. Japan’s Pizza Little Party chain will be selling the gut-busting dish through November 22. Salad Dating App: Long walks on the beach and piña coladas are overrated. What you really need to know when you’re looking for a mate is if they share your taste in salad toppings. At least, that’s what Just Salad, a salad restaurant franchise, is counting on with their new SaladMatch app, which matches you and your salad eating habits with others of the same ilk. Bacon Car: We keep thinking that bacon has jumped the shark once and for all. But then some one else finds a new and more ridiculous way to repurpose the crispy, meaty, obsessed-over breakfast meat. 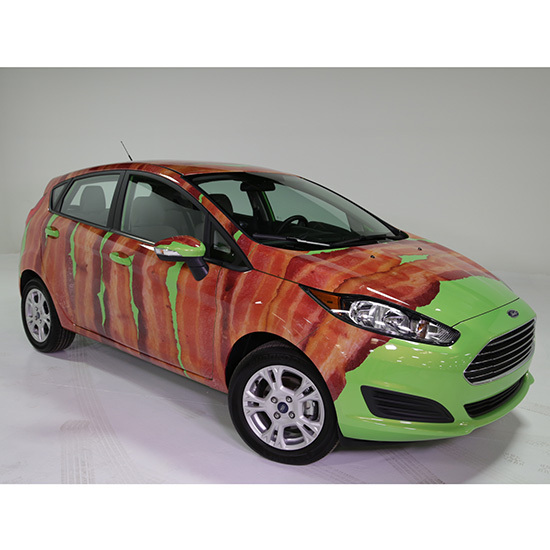 Ford recently announced the availability of giant vinyl bacon strips to decorate the new 2014 Ford Fiesta. Those who want the full bacon treatment should be willing to shell out some serious cash. It costs $3,347 plus installation fees for ten strips. Toast Art: The perfect activity for insomniacs: Creating intricate anime portraits on toast using cocoa, green tea powder and clear plastic sheets for stenciling. Start your toast art at 3 a.m. and by the time you’re done, it’s breakfast! Pizza Button: We can all agree that room service is one of the best things about staying in a hotel. But one hotel has figured out something better: pizza service. Every room at the Country Inn & Suites in Niagara Falls, NY includes a phone equipped with a pizza button, which connects guests to a local pizza parlor. If only all phones came with such a button.